Have you ever wondered what it's like to have your own small business? Be your own #girlboss? Open your first brick and mortar...in less than a week?!?! If you asked us any of these questions prior to June 2015, we would've circled "D" none of the above. It all started last year with two best friends, a teeny tiny studio in Brighton, and a passion for paper goods. Just one year later we're not only focusing on growing our own business, Handzy Shop + Studio, but also building and maintaining brands for several other small, local businesses including Frameri Eyewear, Eli's BBQ and Game Day Feels—just to name a few. We knew if we kept up at the pace we were moving we'd soon outgrow our studio space in Brighton. Before we could even think about looking for a new spot we stumbled upon a cute, little storefront located at 15 West Pike Street in cool Covington. We immediately fell in love! Our vision was coming to life before we even signed the lease! 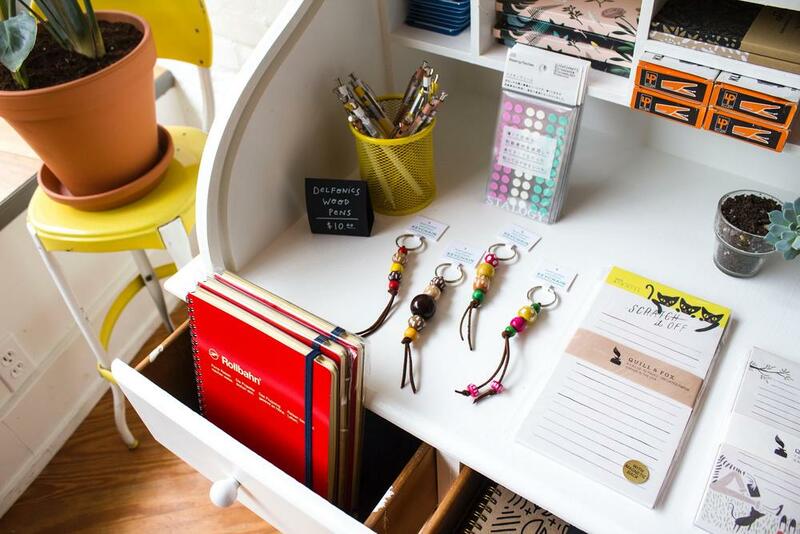 Handzy Shop + Studio: A carefully curated collection of paper goods, stationery, local art, gifts and gift wrap, of course. So how did we pull it all together that fast?? With our grand opening and ribbon cutting ceremony just two weeks away, it was time to say goodbye to Brighton and start fresh in Covington. If you've ever moved, you probably know that the hardest part isn't getting your stuff from point A to point B, but rather unpacking and organizing once you get there. In the midst of the moving madness, we still had to focus on Handzy and the other businesses that we do work for, not to mention order inventory for the shop—it was officially grind time! It goes without saying, the shop sat a cluttered mess with boxes everywhere for a week while we focused on our other obligations. We blinked and reality began to set in—our grand opening was only one week away! I could try to explain how we transformed an empty space full of art supplies into a Shop + Studio, but that would be boring so I'll just cut to the chase. We enlisted the help of friends and family to craft and install shelves to display our products, build a point of sale and eat pizza with us late into more than one night as we rushed around and pulled everything together! Fast forward one more week and it was finally the day of our grand opening party and ribbon cutting ceremony! Our hard work had paid off and we couldn't have been more excited!!! After waiting for what seemed like a year (in reality about 8 hours), 4:00 PM rolled around and our guests started to arrive. Even the mayor of Covington made an appearance! Once there was a crowd, we all gathered out front to cut the ribbon and make this business official, with a very large pair of scissors I might add. Our guests made their way back inside to eat, drink, shop, and have fun! We had a wonderful time seeing old friends, making new ones and more importantly we couldn't have made it happen without all of their help. To everyone that helped us out and came to celebrate with us at our grand opening, thank you! And just let us know if you ever need a hand. Happy Friday friends! This is the first blog post of hopefully many more to come!! If you want to stay connected to the happenings at Handzy Shop + Studio bookmark our blog or enter your email address below to sign up and be added to our email list!